Things have wobbled about a bit this month but our portfolio managed to finish up in the green with combined assets up over £2,000 since last month. I haven't been doing much trading as we're in a state of limbo as regards how much cash we will need for the next couple of years (my son still hasn't heard whether he has a place on his MA course and there's been no further news on my VR). The only investments I have made are £500 into my LGPS AVC, £57 into my CIS FSAVC (still waiting for this to be transferred into my SIPP) and a small amount of re-invested dividends ploughed back into my ISA. All in all it's been a pretty unexciting month. However, I have been pleased to see that my Herald Investment Trust (global small companies in IT, multi-media and comms) has now made some steady progress (up just over 10% during the period I've been drip feeding it) and TR European Growth Trust seems to be hanging onto most of the profit it has made for me (19%) (don't know how long that will last though - I have been considering taking some profit from this but holding off for the time being). Globally smaller companies seem to be doing quite well currently with my FTSE 250 tracker also standing at 10% up, although Aberdeen Asian Small Companies just keeps on dropping (down 16%) and the modest amount I have in an S&P small cap tracker is refusing to make profit and has slipped into the red again. 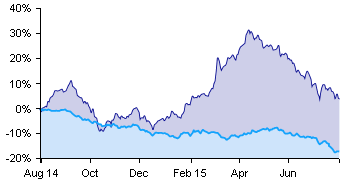 What's not been doing so well recently is my iShares Global Clean Energy tracker. I can understand why clean energy companies in the UK could have been taking a bashing due to the fact that the government has been reducing subsidies, but what the drop says about global trends following a surge in investment in 2014 is a little worrying. Maybe it's too soon to see it as an indicator of anything. The fact that fossil fuels reap 4 times more in subsidies from world governments than renewable energies can't help though. Although July's been fairly quiet maybe August will bring some excitement. Today my £9,000 worth of premium bonds will be going into the draw for the fist time. Considering the upheavals caused by Greece and China, it's probably good news that July was fairly uneventful for you and could be a good sign that your investments are diversified enough to not react adversely to such upheavals. Good luck with the premium bonds - I have my fingers crossed too! Hi weenie, when I said "uneventful" I didn't mean that there hasn't been some turbulence :-) My biotech fund dropped 4% in one day I think, but has since crept back up again. Luckily though things all round have settled on the right side of the line (for the moment). The uncertainty in the markets is nothing compared to the uncertainty in life at the moment. Both sons are at turning points in their lives (the youngest has an interview at the same uni his brother has applied to study at tomorrow so they could both be back living locally soon) and VR for me "on" and then "off" again with every change in the wind - I know you're going through much the same with this. The best policy seems to be not to do very much at all and leave things in cash for the time being but it does get very frustrating for a natural "planner" like me. Uncertainty is all around. These VR things do seem to drag on for ages! What are the two lines on the graph? Pretty solid update considering, Cerridwen! Hopefully your son gets some clarity soon and then you can arrange everything! Good luck with the premium bonds. I had held a modest £200 since 2006. Nothing so far! You--obviously--have a much better chance than I do sitting with £9,000 in there. That is right within the totals that often seem to dominate the winners list each month! Thanks DD. Fingers crossed for all PB owners out there - well, maybe not "all", just the select few of us. Oooh, just seen the premium bond results - one of the £1m winners only has a total holding of £6k!